Real-life spiders, while able to do some remarkable things with silk, are generally somewhat limited in their ability to use it as a ranged weapon. This is not so for their fictional counterparts, who are often shown as able to shoot and launch their silk, both as individual strands and as fully formed webs, to entangle and ensnare their targets. This can be done for a number of reasons, such as dynamism — a spider patiently sitting in its web waiting for prey to pass by doesn't really make for exciting action scenes — or simple lack of research. It's worth noting that some spiders do possess the ability to cast their webs to ensnare prey. They cannot squirt webbing directly at targets, however (they spin a kind of "net", and then pick it up and throw it with their forelegs), and the range and dexterity of their throws isn't generally on the level sometimes seen in fiction. While this is most often applied to spiders, as they're generally the animals most tied to silk and webbing in popular culture, other silk-producing arthropods (like caterpillars and other insect larvae) can easily be granted the ability to launch their webbing in a similar fashion. See also All Webbed Up. Sister Trope to Net Gun. A spider Digimon called Dokugumon has an attack that consists of shooting web from its abdomen. The larval Wormmon relies on silk web techniques that have a myriad of uses, like trapping foes, shooting needle-like web projectiles, swinging or grabbing objects. Ghost in the Shell: Stand Alone Complex: The Tachikomas, while not capable of producing actual silk, have an ability reminiscent of this in the form of web-like guidewires that they can shoot from their pods to swing around as a form of mobility. As shown in episode 2 "TESTATION", they can attach the wires to other moving objects such as the HAW-201 tank in an effort to slow it down with their own body weight. Spider-Man: Spider-Man, while not an actual spider himself, relies heavily on his famous web-shooters, which he holds in the palms of his hands and uses to shoot large quantities of webbing to produce both thick ropes with which to swing from buildings and nets with which to trap villains. 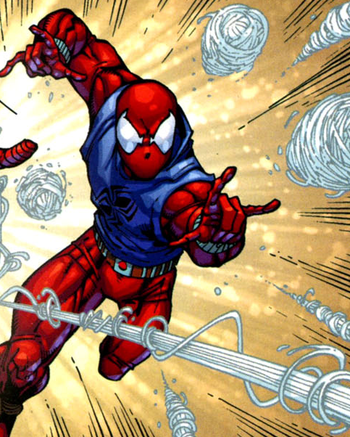 This trope is also employed by most other spider-themed superheroes, such as Scarlet Spider and Spider-Gwen. Others, like Silk, do have organic webbing. Amazing Fantasy features the original web-slinger himself, who teaches a newly spider-powered Izuku how to make his own web formula and web-shooters. An American Tail: Fievel Goes West: Chula the spider functions as errand boy to The Villain, Cat R. Waul. While Waul is welcoming some mice to the town of Green River, Chula is told to issue water. Being a recalcitrant fellow, Chula hocks a loogie at a newlywed couple, which forms an instant web, trapping them inside an old boot. Waul flicks away the webbing and continues his Affably Evil schmooze. Played with by the Giant Spiders in the horror-comedy flick Eight Legged Freaks. Some of them can squirt thick streams of liquid silk from their abdomen to immobilize prey at melee distance, but since they're so friggin' huge it still translates into a meter or two from which they can glue you to the wall behind you. The character played by Scarlett Johansson finds this out the hard way. Conan the Barbarian: In The Tower of the Elephant, Conan fights a Giant Spider. After its first charges at the Cimmerian fail to kill him and cost it a leg, the spider settles for webbing the door shut to trap Conan in the room with it, then trying to snare him with strands of web fired from beyond sword reach. Blade & Soul: Grave spiders can shoot a whole sticky web at the player character, which can envelop the warrior like netting, pinning her to the spot until she can slash herself free. The spider can attack the PC through the webbing, inflicting damage, while the trapped PC must first cut through the webbing before getting any swipes at the grave spider. Donkey Kong Country: Squitter the Spider (one of the Kongs' animal friends) shoots webs, which can be used either as temporary platforms or as a projectile attack. Into the Breach: Several breeds of the Kaiju-sized Vek spray their target with immobilizing webs at close range, including creatures whose normal-sized counterparts do not produce silk at all, like Vek scorpions and the mantis-like leapers. Vek spiders, meanwhile, launch blobs of webbing across the map, which not only hatch into spiderlings after one round, but also web up all adjacent enemies until they do. Kirby Star Allies: Kirby's new ability introduced in this game, Spider, lets him (among other things) shoot webs at range that quickly encases minor enemies in pods. Pokémon: Several Bug-type moves are themed around a Pokémon shooting or spitting strands of silk at its opponent. The old staple String Shot is typically themed as a Pokémon shooting strands of silk from its mouth to bind its opponent. It's most often learned by Pokémon resembling caterpillars, other insect larvae or spiders. This tends to be particularly evident in the anime, where moves such as Electroweb, Spider Web and Sticky Web are often depicted as the user (typically a spider-like 'mon such as Ariados, Galvantula or Dewpider) tossing fully-formed orb webs at its opponent, or alternatively as sticky globs that turn into webs on contact with a target. Notably, the moves' descriptions in the games just reference their users spinning or weaving nets around their targets — no active launching is implied. Spelunky: The Giant Spiders can shoot balls of silk that turn into webbing that can impede player and other mobs. Starcraft I: Zerg Queens can barf up a mass of sticky green substance over an area that greatly slows any units caught in it. It also reveals cloaked units, making it useful against Ghost nukes. Warcraft III: Crypt Fiends and some Nerubians have the Web ability, which spits a mass of webbing at an enemy flyer, bringing it down to earth where ground units can attack it. Spinnerette: After Heather gains her superpowers following an incident involving a prototype "genetic infusion chamber" and spider DNA, she gains the ability to shoot threads of strong spider silk... from new glands at the base of her spine, in a position roughly analogous to where a spider's spinnerets are in real life. My Little Pony: Friendship Is Magic: Flyders — spiders with insect wings depicted in the episode "Campfire Tales" — can squirt strands of webbing from their spinnerets with a fair degree of accuracy. One is able to shoot out enough webbing to cover half of Sweetie Belle's face with a single shot, while another shoots out a strand accurately enough to tangle Applejack's legs bolas-style in mid-gallop. This is in fact Truth in Television in the case of a few families of spiders. The Deinopids , also known as the net-casting spiders, spin webs of elastic silk that they hold in their front legs as they hang upside-down over the ground or a tree branch. When a prey item passes below the spider, the latter quickly stretches out its web and throws itself on top of its target, entangling it in the net. The gnaphosid ground spiders, which hunt prey by chasing it down rather than spinning trap webs, can quickly eject strands of thick, glue-like silk to tangle and ensnare their quarries, allowing the spiders to minimize their risk of injury while subduing their prey. They cannot shoot directed streams of silk, however — rather, they run around their targets while trailing their webbing, entangling them as they go. The Scytodidae, or spitting spiders , catch prey by spitting a mixture of liquid silk and venom. The mix congeals on contact, both immobilizing and envenoming the target. Some of the best web-spitters are not spiders at all, but the onychophora, or velvet worms. These close relatives of arthropods possess twin "slime cannons" on their face that can squirt a fast-drying glue, immobilizing their prey.